We Custom design programs to provide season long control of all vegetation in order to provide the safest environment for hydro substations, Natural Gas valve sites and refineries, and any other utility that requires complete vegetation control. We provide program scheduling, equipment and trained personnel. Our approach to controlling noxious vegetation includes a wide variety of best management practices to address the many issues involved. 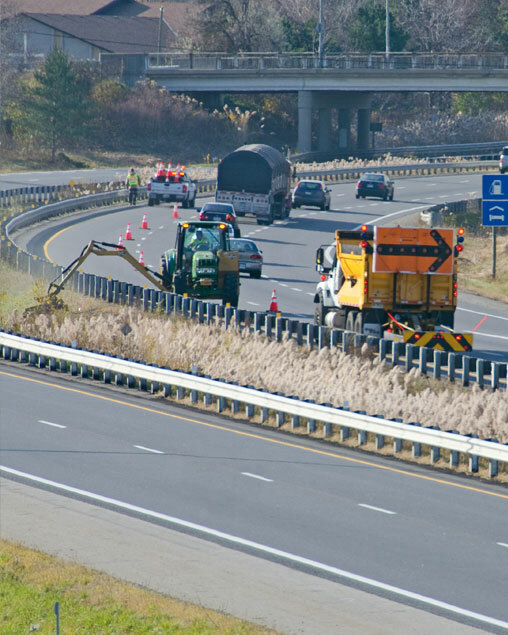 This approach includes an assessing the problem vegetation and existing conditions and environmental assessment to determine the type of roadside environment desired. Roadside vegetation management is required to prevent the unwanted vegetation in agriculture lands, and transportation corridors that generally have a greater potential for the invasion and establishment of weeds. Roadside spraying is also done for control of vegetative growth in and around guard rails, center & right side medians. Other objectives of roadside vegetation management are to enforce bylaws and policies and the control of invasive species, and to enhance roadway aesthetics. The Ecoblade system cuts and kills unwanted vegetation in just one pass by delivering herbicide directly to the cut surface. It’s eco-friendly and cost effective. Using innovative WetBlade technology, the Ecoblade cuts through unwanted brush and invasive weed vegetation and applies herbicide simultaneously in the same application. The process delivers chemicals directly to the blade, so there is no wasted herbicide, no wind drift, and no ground soak. This process helps to ensure that we are applying the herbicide in the most direct fashion, minimizing, and eliminating in direct herbicide contact and maximizing efficacy of the product.